Wood Wharf is a major new 7 hectare development to the east of the Canary Wharf site in London's Docklands. Given the go-ahead by Tower Hamlets council late in 2008 the site will comprise several new towers, of residential (around 1,500 new homes) and commercial nature, generating employment for around 20,000 people. Proposals to serve public transport requirements include a subway with 'travelator' connecting the site to the Jubilee Line station at Canary Wharf. But Canary Wharf station is already at saturation. Seeing as the Jubilee line passes directly under the Wood Wharf site would it not make a lot more sense to attach a new station to the line? Wood Wharf development in the context of Canary Wharf. New development shown in blue and mauve. Neither Tower Hamlets nor the developers seem to think so. The philosophy is that once a line has been built new stations are a no-go. Furthermore, Crossrail is destined to serve the area, although at a point some way north of the Jubilee Line station and quite a bit further from Wood Wharf. Recent trends on London Underground are for larger inter-station spacing rather more than the 450m inter-station distance between Canary Wharf and a possible Wood Wharf station. 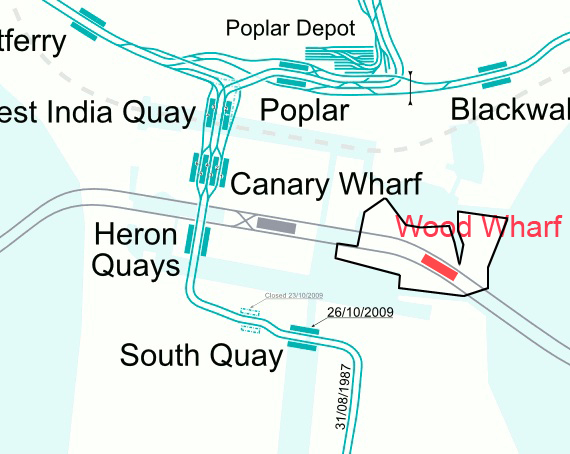 Canary Wharf station (grey) and potential Wood Wharf station (red). 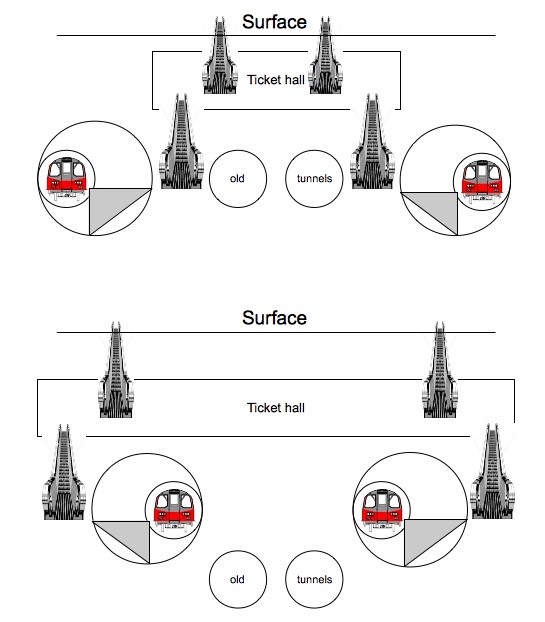 Station separation (centre to centre) would be approx. 450m. The Wood Wharf development is bound by the black line. Some will argue that it will increase journey times on the line. The Jubilee Line has relatively few stations for its length, with notable gaps in Bermondsey and East Rotherhithe. Crucially, the Wood Wharf station would sit outside the central stretch of the line, between Baker Street and Canary Wharf, so it would have no impact on journeys between the West End and Docklands. The only journeys it would impact are on the short stretch between Canary Wharf and Stratford. For comparison, station distribution in the City of London at the same scale. But how to construct such a station on a functioning line? This could be achieved by in fact open digging into the basin of Wood Wharf to construct platforms, adjacent to the existing Jubilee Line. Spur tunnels could then be bored to connect the new platforms to the existing line, at the very end of the process, when ticket halls, escalators etc are already in place and ready to work. The switch of route could be almost overnight. Since the whole site is to be cleared, there are no surface buildings to constrain construction. This presents a wonderful opportunity. The existing through tunnels need not fall inoperative but can remain as alternative through routes or sidings/turnbacks. See diagram. 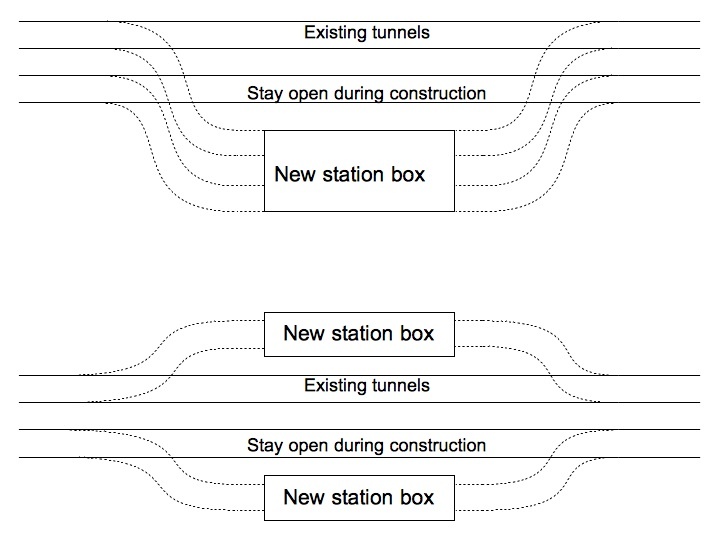 Construction of new platforms can be done with the line still open, either to one side, or either side of the line. The Mindroutes team believe the Wood Wharf station could be constructed for as little as £30m. With such a large commercial project being undertaken much of the cost could be contributed by developers. Canary Wharf station is already as big as it can be and is close to saturation - 50m journeys/year approx. Extra works to increase capacity will be expensive. Plans to provide an underground walkway to Canary Wharf will require much more extensive tunneling and be very expensive anyway. 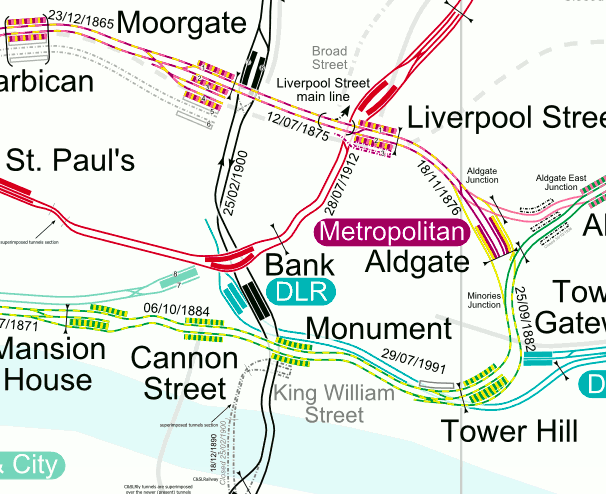 The Jubilee Line tunnels are already there under the site - minimal tunneling is necessary. The catchment for the station is substantial. Ridership could easily exceed 10m journeys/ year and provide relief to overstretched Canary Wharf. Increase in journey times on the line will be negligible compared to time savings for passengers at surface. Prudently the Canary Wharf team do not want construction at Wood Wharf to start until their existing office space is let. The potential for building this station exists before the building of the surface development. Once the ground is covered in expensive real estate this simple project becomes a major undertaking, much more expensive and much less feasible. Wood Wharf station is an opportunity to be realised now.